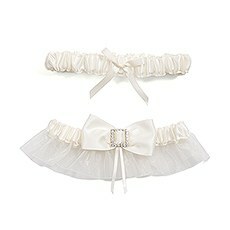 One to keep and one to toss, elegant satin garter sets in ivory and white. Wearing a pretty satin or lace garter ready to toss is a fun wedding tradition. 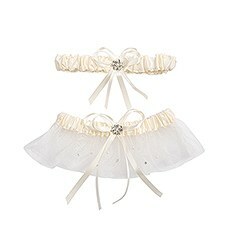 Take part in one of the oldest wedding traditions with our lovely selection of wedding garter sets at Weddingstar. This tradition dates all the way back to the Dark Ages, when friends and family would help the newly married couple disrobe after their wedding ceremony - a piece of the bride's wedding dress would be kept as good luck. This piece of wedding history has been passed down for hundreds of years and is now translated into the garter tradition, where the groom removes the wedding garter from the bride's leg, usually during the wedding reception, and tosses it to the eligible men in attendance.Weddingstar has many designer bridal garters to choose from - browse our selection to find the wedding garter set and style that is just right for you.Choose from different styles and designs of bridal garters - find the personalized garters that match your personality, color or wedding motif. We have two-piece wedding garter sets or single bridal garters in different designs, colors and styles.Our high-quality designer bridal garters come in white, ivory and black - each have an attention to detail that is breath taking. These bridal garter sets come in seductive black lace with a gorgeous satin bow, crystal studded white lace and delicate organza material that adds an elegant touch to the bridal garter. 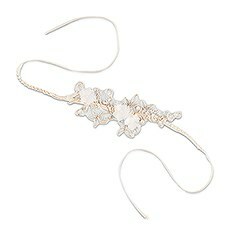 Our Fairytale Dreams Bridal Garter Set is embroidered with the script, "And they lived happily ever after." It also features Cinderella's glass slipper in a dainty silver charm. 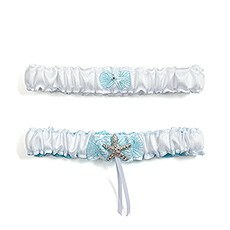 For a nautical-, beach- or tropical-inspired wedding theme, choose our Seaside Allure Bridal Garter Set, with a delicate starfish-shaped silver charm and satin accents.Single bridal garters are available as well. Choose from our selection of Toss Bridal Garters, available in a huge variety of colors - from red and burgundy to Victorian purple, Caribbean blue and chocolate brown. Our Embroidered Applique Bridal Garter in ivory is a stunning piece of art with its mix of lace and rhinestones, and has a tie closure to allow for various thigh sizes. 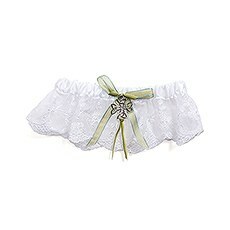 Bring good luck to your ceremony with our Celtic Charm Bridal Garter, which features a green ribbon and a Celtic Trinity Knot.Our lovely designer bridal wedding garters will ensure that you will participate in this age-old tradition in style!